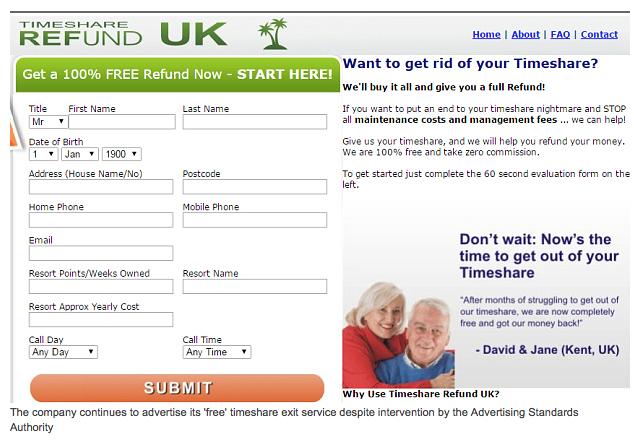 Sell your timeshare free’ website exposed over £3.5m refund claims. The above title is from an article published today in The Telegraph and written by Kate Palmer. The company with a website called “Selltimesharetoday.co.uk” has been slammed by the Advertising Standards Authority for making misleading claims about money awarded to customers. Selltimesharetoday.co.uk says it has secured customers £3.5m back on their timeshare agreements, free of charge, but this figure was deemed “unsubstantiated” and “misleading” by the watchdog. Mindtimeshare already detected this company in 2011 and we brought this company to the attention of the different Timeshare companies, whose logo appeared on this web without their permission. In 2011 Selltimesharetoday.co.uk actually already claimed that they had recovered the £3.5m for Timeshare owners! As explained further in the press article, the ASA’s powers to crack down on such websites are limited. It cannot fine or take advertisers to court, because it is not a statutory body. In exceptional circumstances it can refer cases to Trading Standards, which has the legal power to fine. Instead, the authority will impose sanctions, including asking search engines to remove any paid-for search advertisements when they link to a page with non-compliant adverts. If this fails, they will launch a campaign against the business to warn people against their services. They use “Ad Words”, such as the example above, which are paid-for advertising banners on search engines that name and shame the errant company. The authority has now referred Selltimesharetoday.co.uk to its Committee for Advertising Practice, which will decide on a suitable sanction. We from Mindtimeshare are certainly very pleased to hear that websites like this, where alleged false statements are made in order to get consumers to take up services from a company, based on these statements, are now looked at closely by the authorities and fined or closed down where proven wrong. This entry was posted in Bogus resale companies, Warnings and tagged Advertising Standards Authority, ASA Ruling, Claims Company, company, Discounted accommodation, Kate Palmer., misleading claims, Refund Claims, search engines, The Telegraph, Timeshare Refund UK, Timeshare Resale, Trading Standards. Bookmark the permalink.